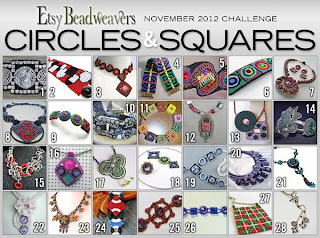 Pipa the Latest: journal of a messy crafter: EBW November Challenge "Circles and Squares"
This month challenge has a geometrical theme: Circles and Squares! Compose circles and squares into new shapes, emphasize the contrast between round and angular, soft and hard. There are no color restrictions but try to underline the contrast via your color choices. Shapes are not intended to be achieved by the shape of a particular bead only, but by the shapes and patterns in your weaving/embroidery."